Purple/violet dome lens LED. #555 style with wedge (push-in) base. Frosted lens. 6-volt AC or DC. 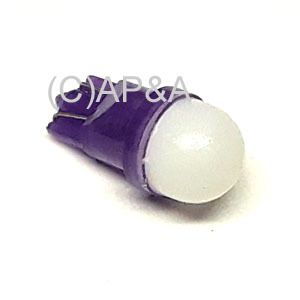 Great for general illumination lighting on the playfield, behind backglass, and anywhere you want a nice-looking bulb that is visible to the eye, and that disburses light nicely- much like an incandescent style bulb. Dome LED Diameter: Dome LEDs measure 15/32-inch (just under 1/2-inch) in diameter around the middle. If the hole you are installing them through is not larger than this, then a dome LED will not fit (you can use a 3-element LED instead, which is narrower). Please measure the lamp hole(s) in your game before ordering, as LEDs are not returnable.